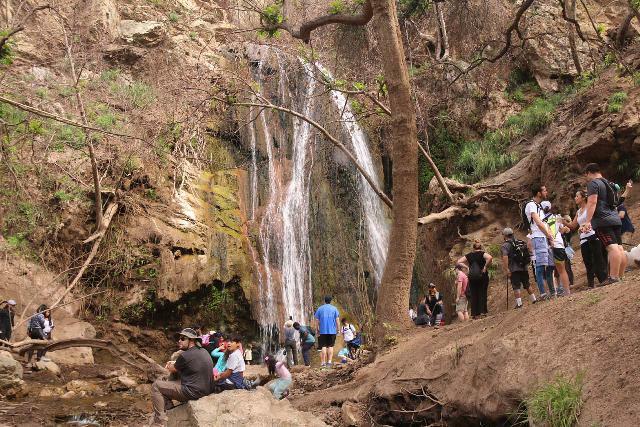 Escondido Falls could very well be the tallest waterfall in the Santa Monica Mountains. 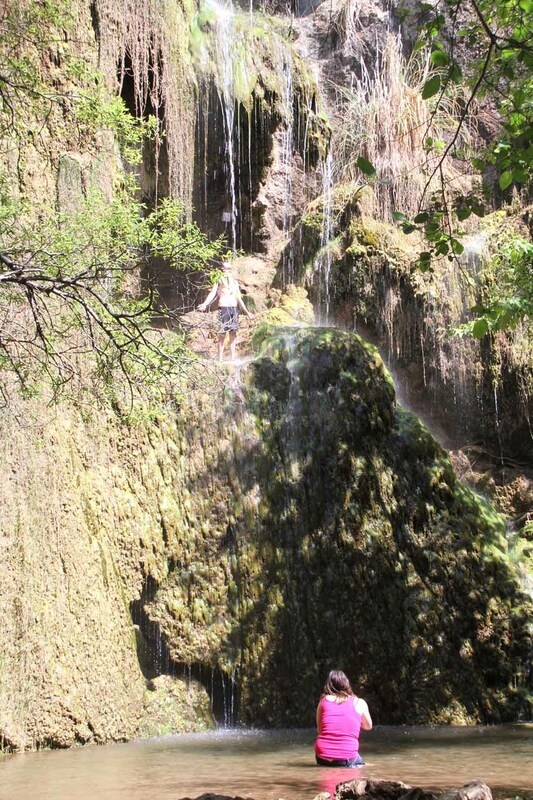 It consists of a lower drop of about 40-50ft as well as a much taller upper drop of at least 150ft or more. If you include the hidden middle tiers between the two main drops, then this waterfall could very well be over 200ft tall! 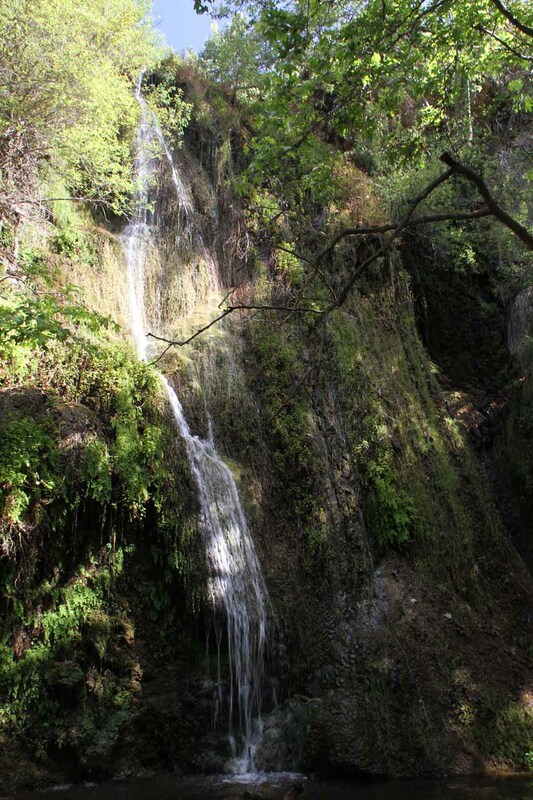 Like with most coastal waterfalls in Southern and Central California, the underlying cliffs supported mossy growth. 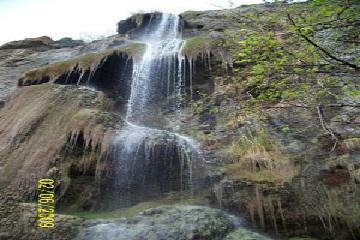 This tended to give such waterfalls “character” as Julie likes to say. 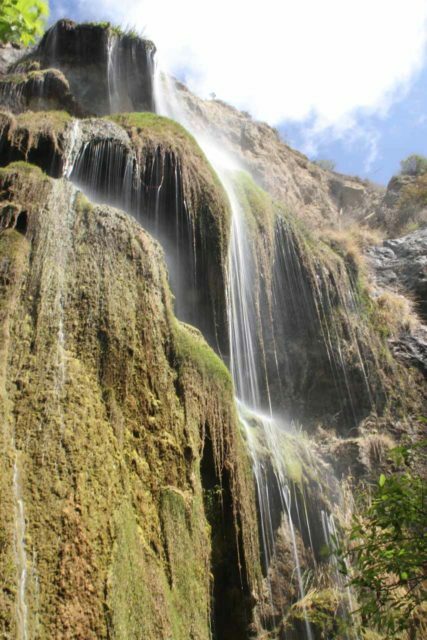 The word “escondido” is Spanish for “hidden,” and it seemed to be quite an appropriate name for this waterfall. That was because Escondido Canyon sat behind some super big homes with gorgeous ocean views that typify the prime real estate of the Malibu area. 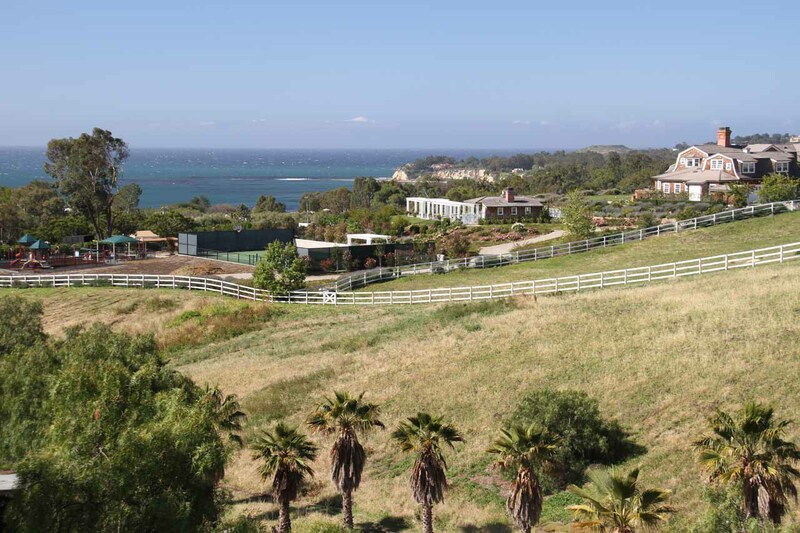 Indeed, such developments concealed the wilderness behind these homes. 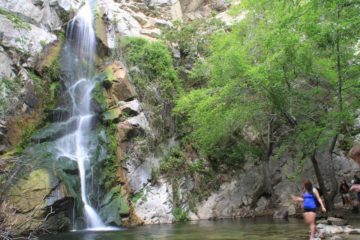 Moreover, the upper waterfall itself was elusive to the uninitiated, and it required a bit of a risky adventure to reach. 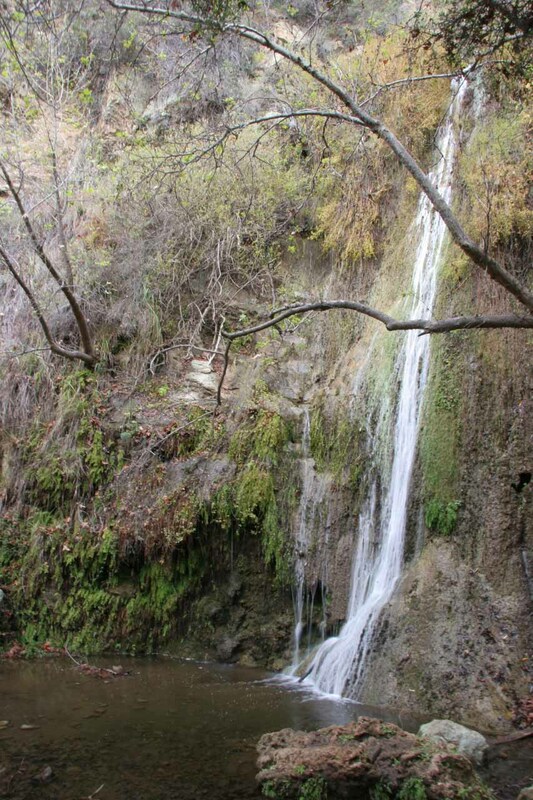 The Lower Escondido Falls was very easy to reach as it only required roughly 3.5 miles round trip of hiking. 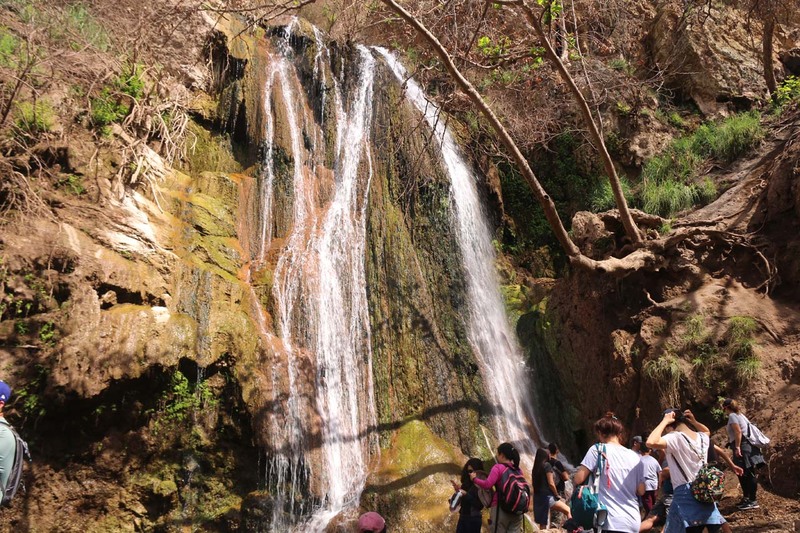 Thus, it tended to receive the vast majority of its visitors. 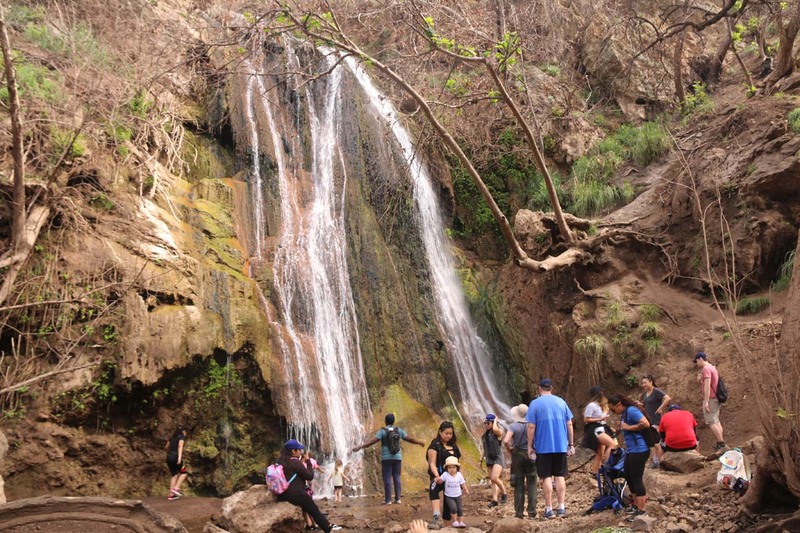 Over the years, we’ve seen this waterfall go from a relatively obscure local waterfall into a very busy spot, especially on the weekends. That means parking can be an issue without an early start. Also, being a rainfall-dependent waterfall, it tends to flow only on years where we’ve had an appreciable amount of rain in the Winter months. 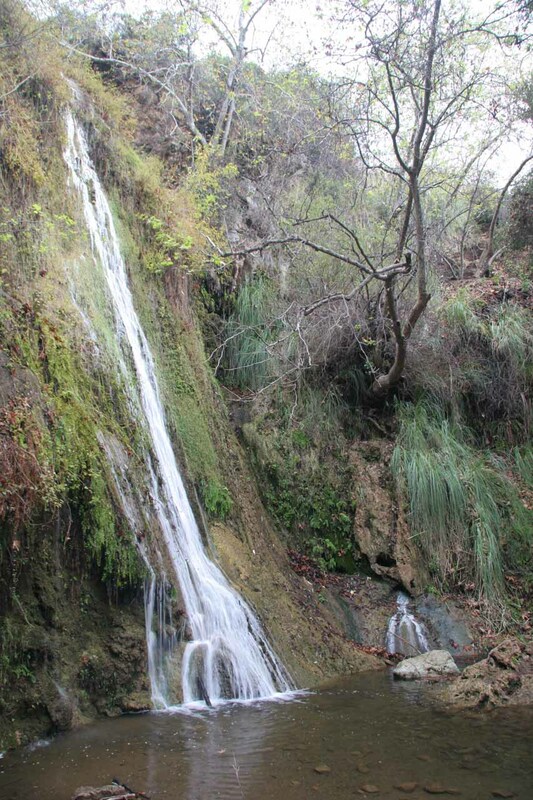 Given the combination of a pretty dry climate with a Climate Change-induced feast or famine wet versus dry year unpredictable pattern, only certain years could we expect the falls to flow nicely in the Spring. 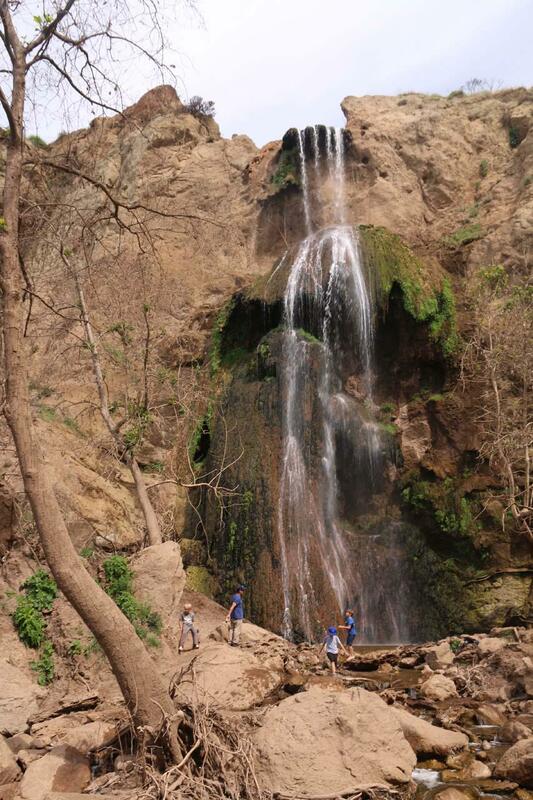 At other times of the year, or on poor rainfall years, we generally don’t expect this waterfall to perform. After parking the car (see directions below), we had to walk up the Winding Way Road. 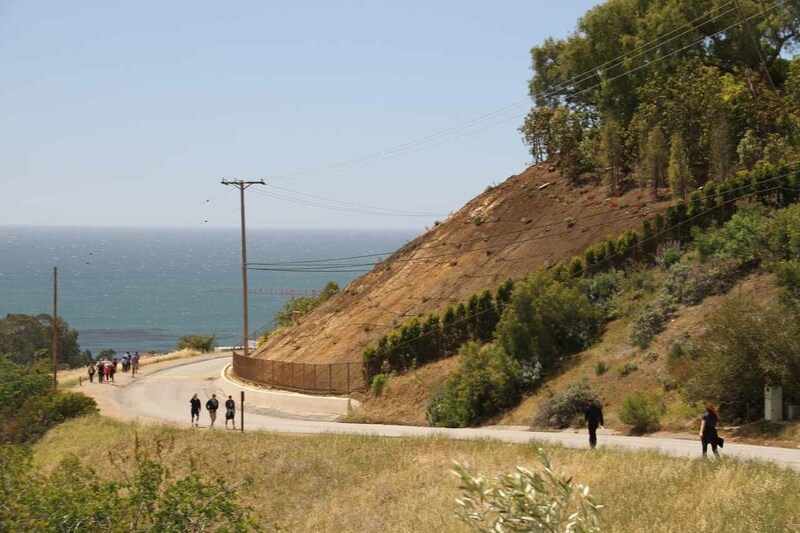 This road was really a residential street passing by a handful of multi-million-dollar homes with ocean views. 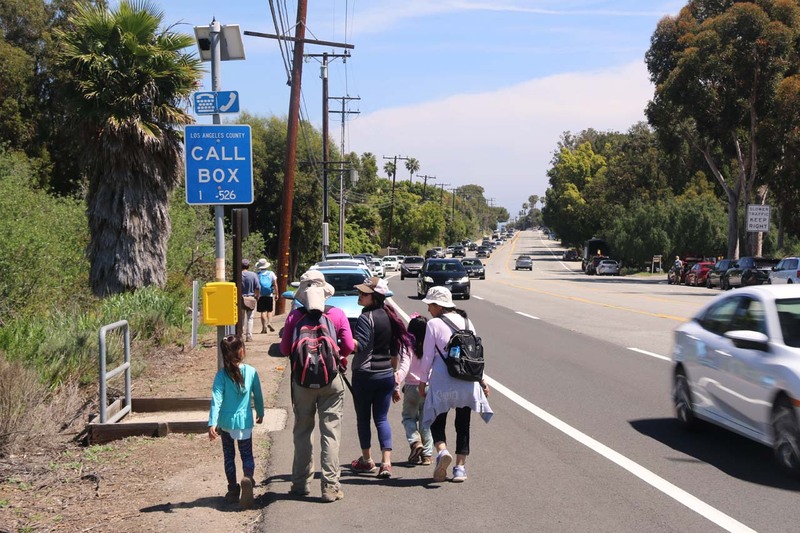 We had to walk this stretch because no street parking was allowed throughout this road. 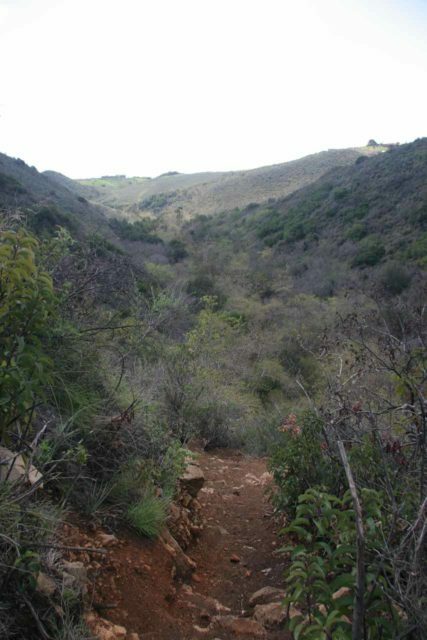 For roughly the first 3/4-mile of the hike, Winding Way Road climbed to an apex before descending into Escondido Canyon. 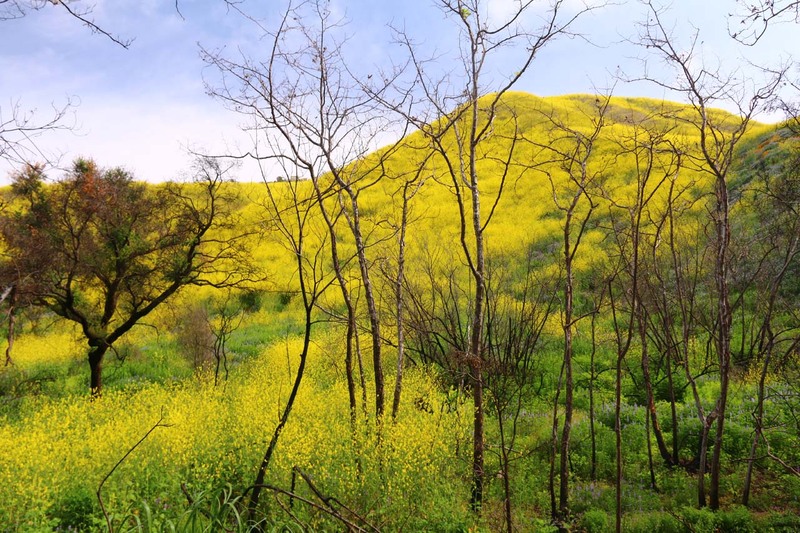 Depending on the amount of rainfall and the timing, the hillsides flanking Escondido Canyon may bloom with large mats of yellow and purple wildflowers. 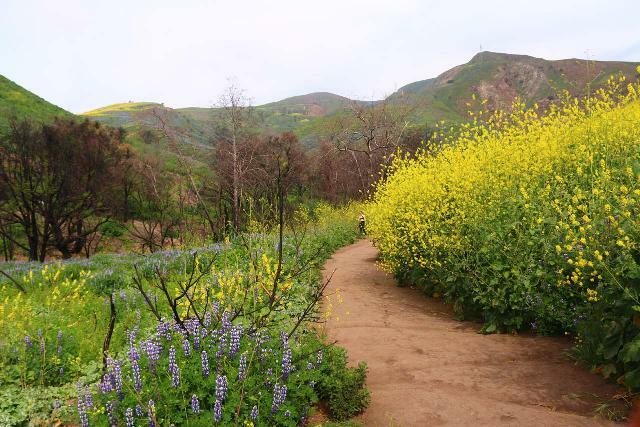 According to a staff member we spoke to here, he mentioned that most of the yellow flowers were actually the invasive black mustard. 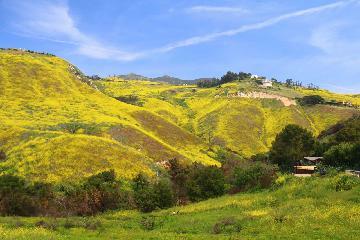 However, the native flowers we’ve seen here include lupines, sunflowers, and even the odd California Poppy. 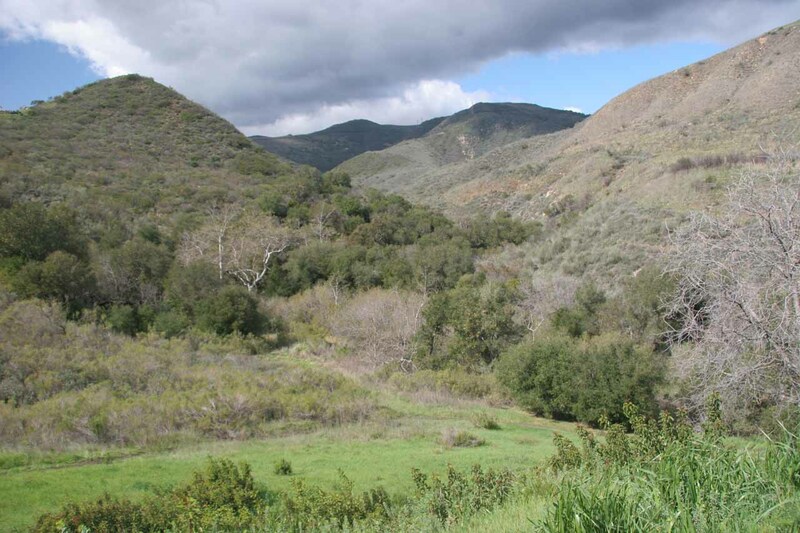 As the Winding Way Road descended into the canyon, we then left the road and descended the trail as it entered the Santa Monica Mountains Conservancy. 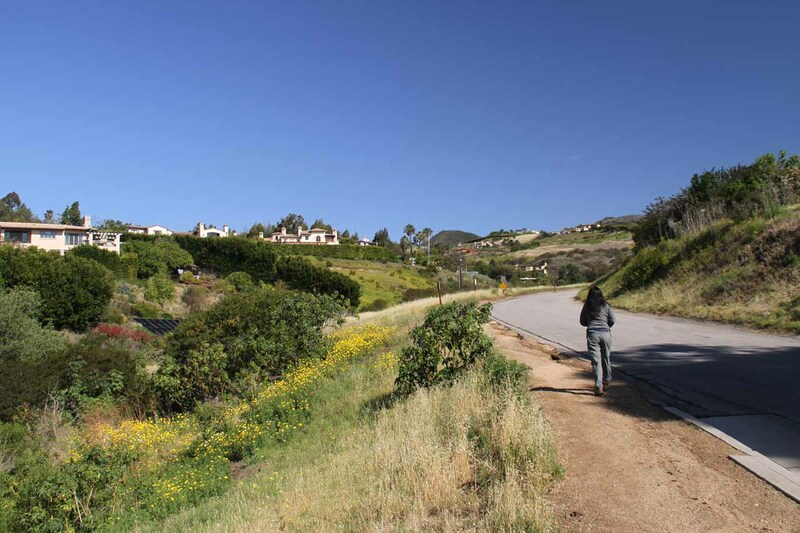 The trail used to leave the road past the last house along Winding Way Road, but they’ve since re-routed it to the current spot (perhaps to respect the privacy of that last homeowner). 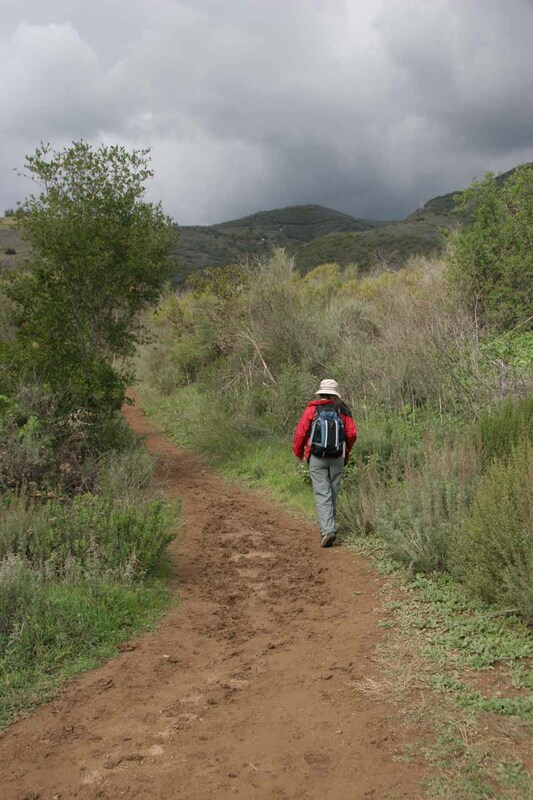 In any case, depending on the conditions, this trail as it left the pavement can be muddy and slippery. 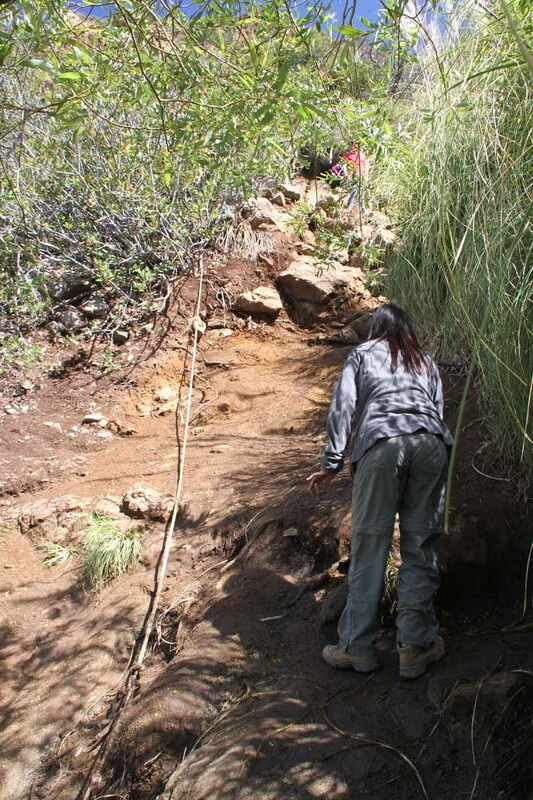 It can also be dry and eroded with the odd mini-gully cutting right through the middle of the path. 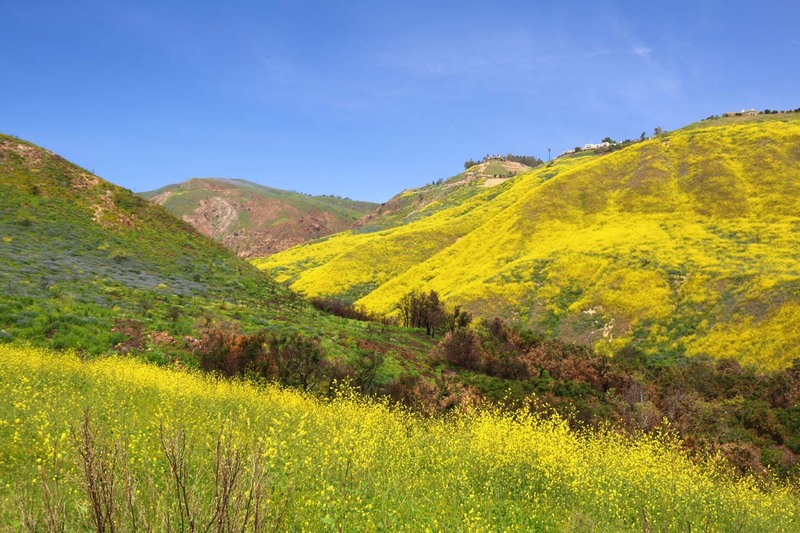 And then, on our most recent visit, the entire area seemed to be blanketed with wildflowers both on the hillsides and even flanking the immediate trail. 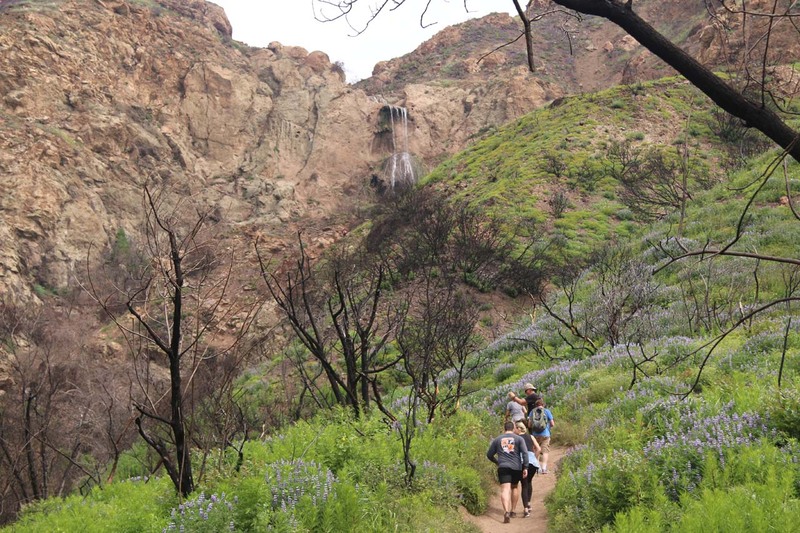 Once the initial descent into the canyon bottomed out, we then crossed a creek, which I suspected was part of the same creek responsible for the waterfalls. 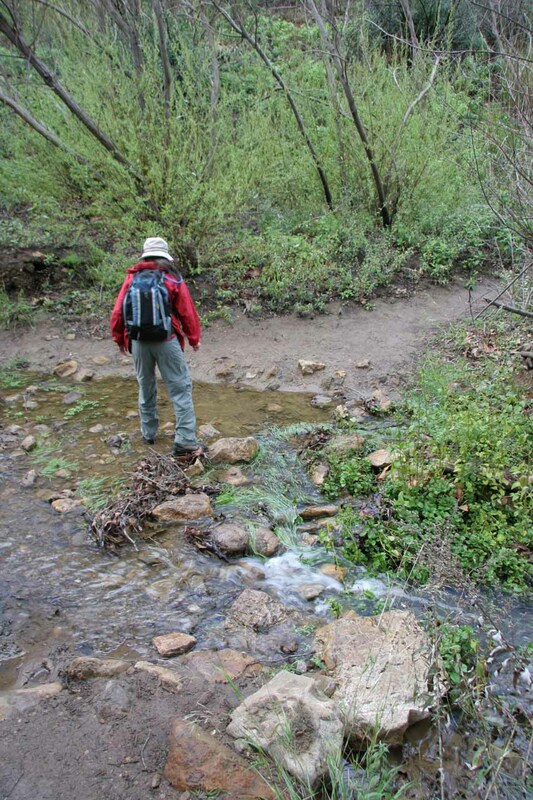 This was the first of a handful of creek crossings, especially if the creek has an appreciable amount of water (a good sign that the waterfall would be flowing). Overall, we counted about five such creek crossings, which were mostly trivial though having Gore-tex boots as well as trekking poles certainly helped. 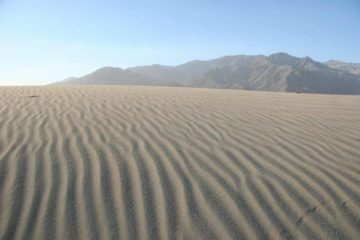 The trail was mostly flat with very minor undulations as it generally climbed a couple hundred feet over the next mile. 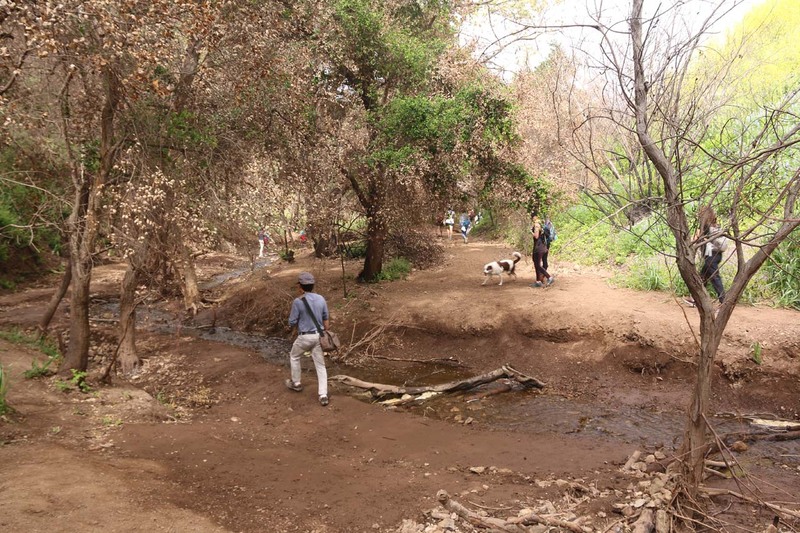 As the trail generally followed the creek upstream, we tended to see a fair amount of trees providing some degree of shade. 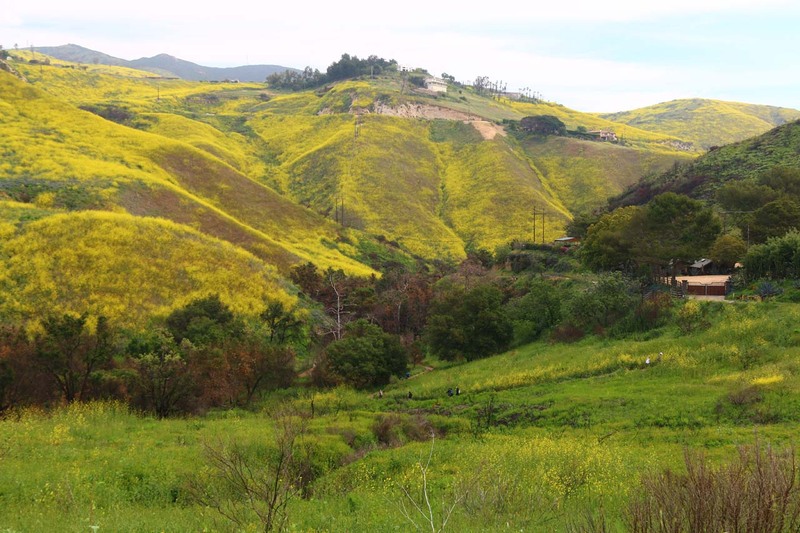 We also encountered a few clearings which presented the best places to spot wildflowers as well as the odd home perched atop the ridges overlooking Escondido Canyon. 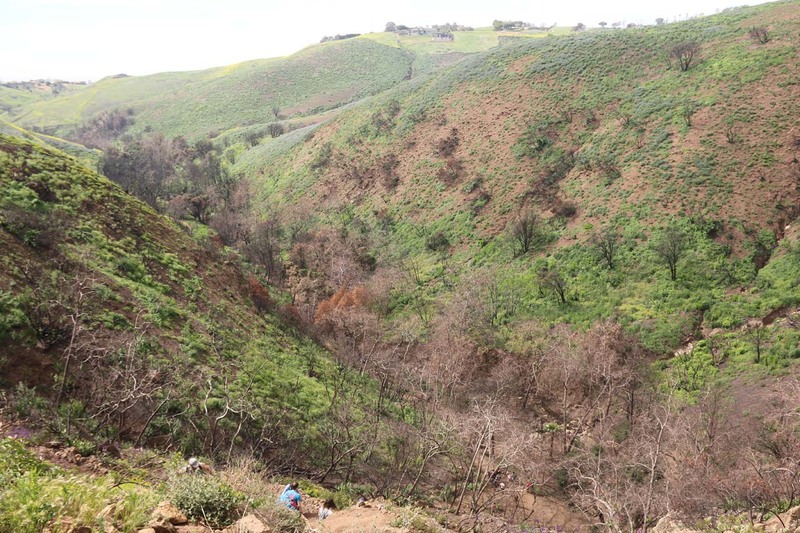 On our most recent visit in 2019, which followed the Woolsey Fire, we noticed a lot of the trees that once provided us shade had burned. 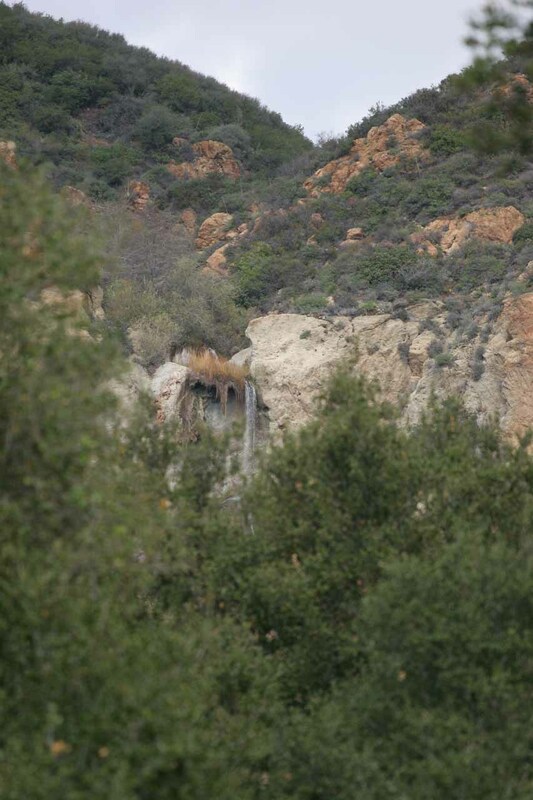 Eventually after about 1.5 miles from the trailhead, we started to catch glimpses of the Upper Escondido Falls high above the canyon. 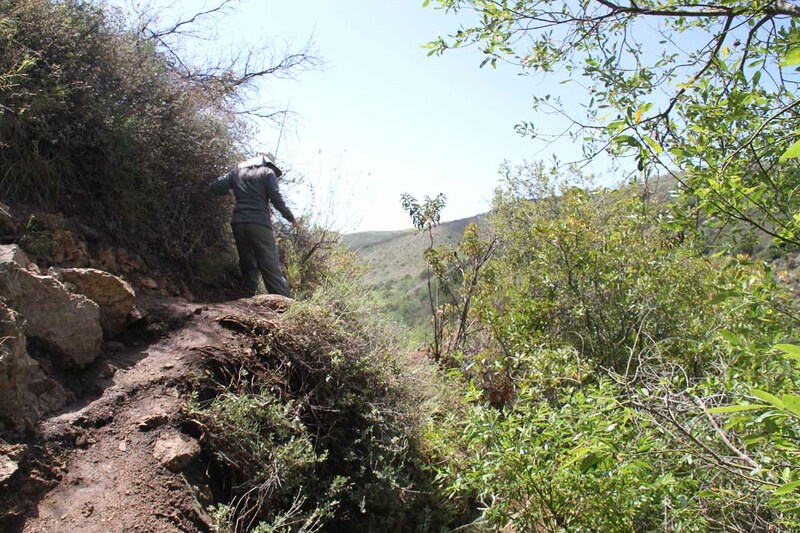 In our first couple of visits, there was enough vegetation to conceal most of this upper tier. However, after the fire, it seemed like this upper drop was clearly visible. 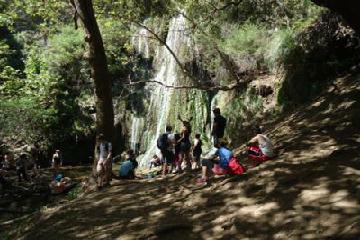 Eventually after around 1.75 miles or so, we finally arrived at the Lower Escondido Falls and its 40-50ft mossy drop. 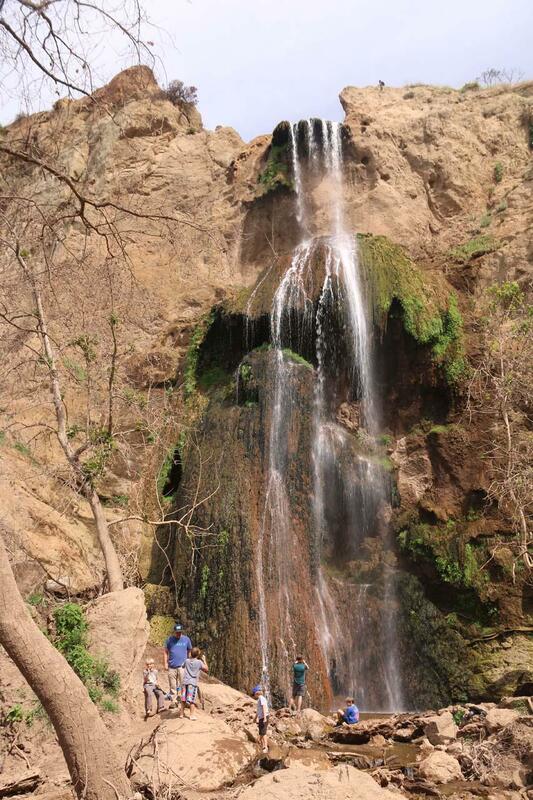 This waterfall provided a nice backdrop for photos as well as letting the kids play in the water. 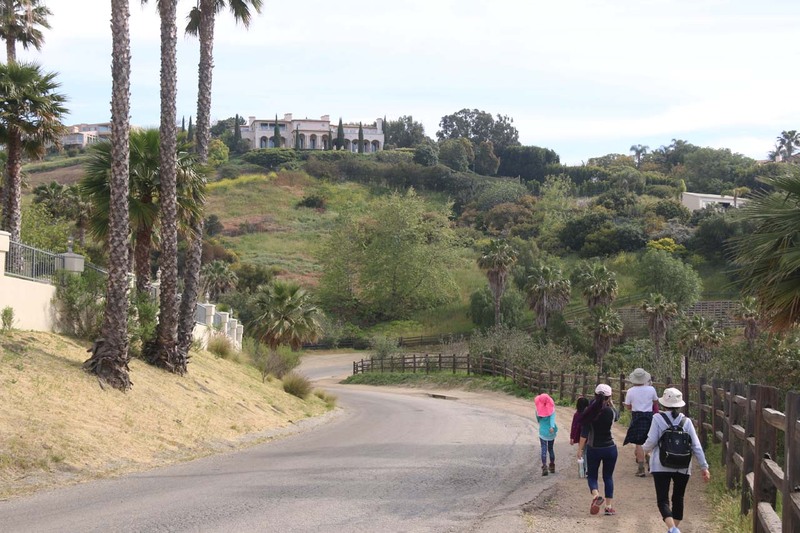 The only concern I had with the water quality of the creek had to do with how much of its contents consisted of suburban runoff from the homes perched above Escondido Canyon. 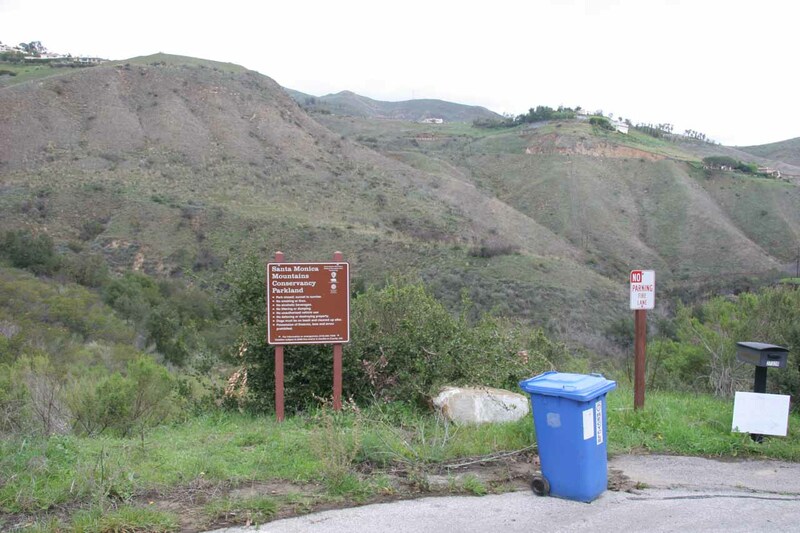 Anyways, this is where most people would turn back and return to the trailhead, which would make the overall hiking distance on the order of about 3.7 miles round trip. 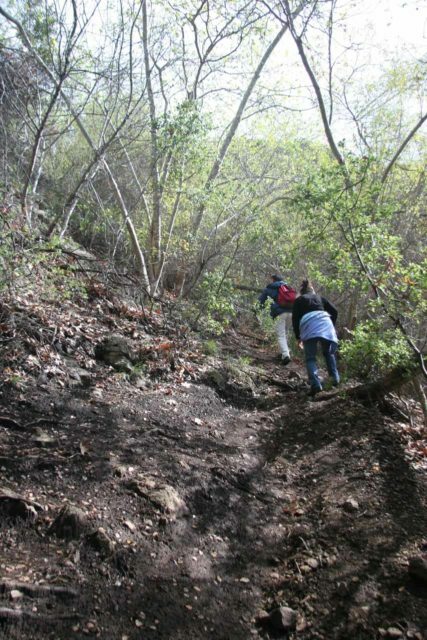 In order to access the base of the Upper Escondido Falls, we had to go on a steep climb for about a quarter-mile. 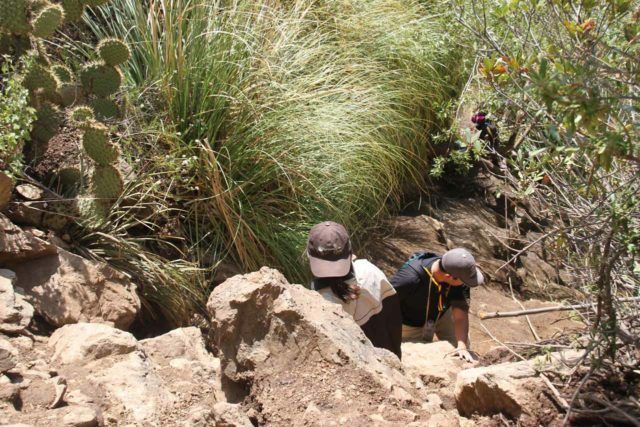 We have to caution you that if you want to continue, it’s not for everyone as it contains dropoff hazards as well as rockfall hazards (especially from other people kicking rocks down). I’d recommend not attempting to go to the Upper Falls in tennis shoes or running shoes due to insufficient grip on the steep and slippery slopes. 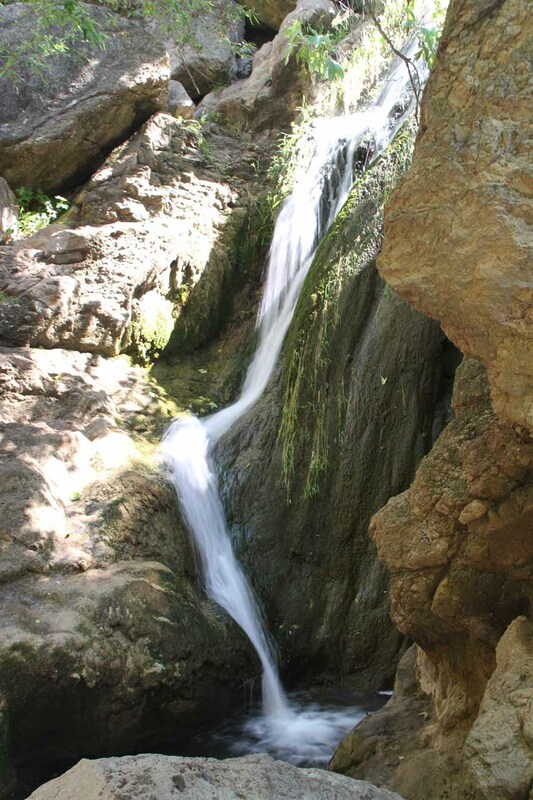 The scrambling path followed a steep gully on the east side of the creek (to the right of the waterfall). The trail became progressively steeper the higher up we went, and it required the use of all of our limbs to climb up rocks while trying not to lose our footing (which was really easy to do). 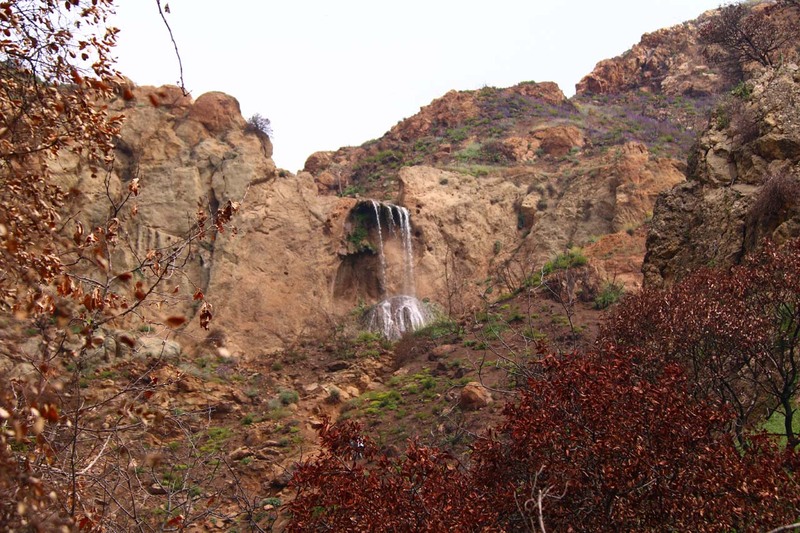 There were about three or four sections during the climb up to the Upper Escondido Falls that Julie and I thought were potentially hairy. 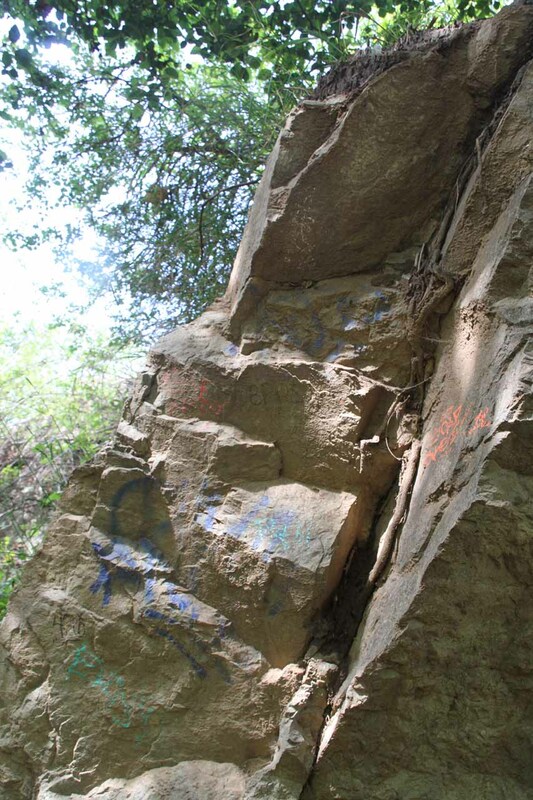 In one particularly eroded section, we had seen a rope set up to make it less likely to slip and fall into a dropoff right above the brink of the Lower Escondido Falls. That rope may not be there, however, nor could it be relied upon as it was not a sanctioned aid. 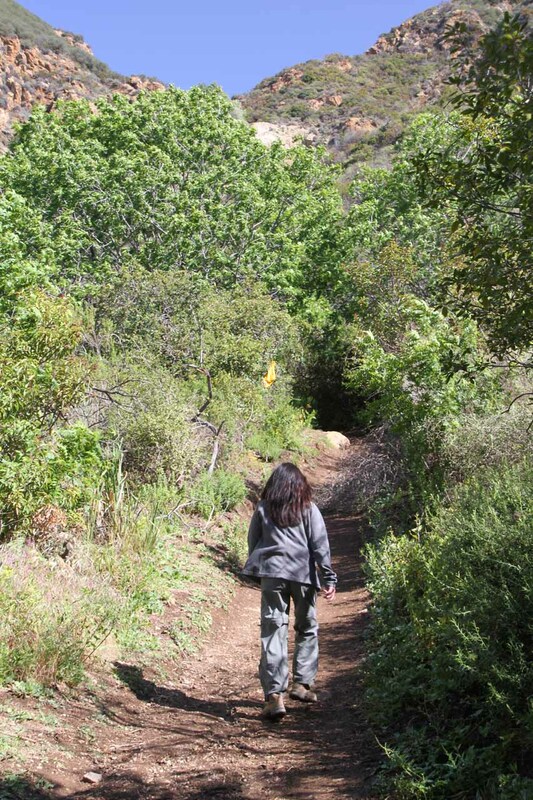 Once we were past these obstacles, the “path” went around a bend with a nice view of the canyon below us. 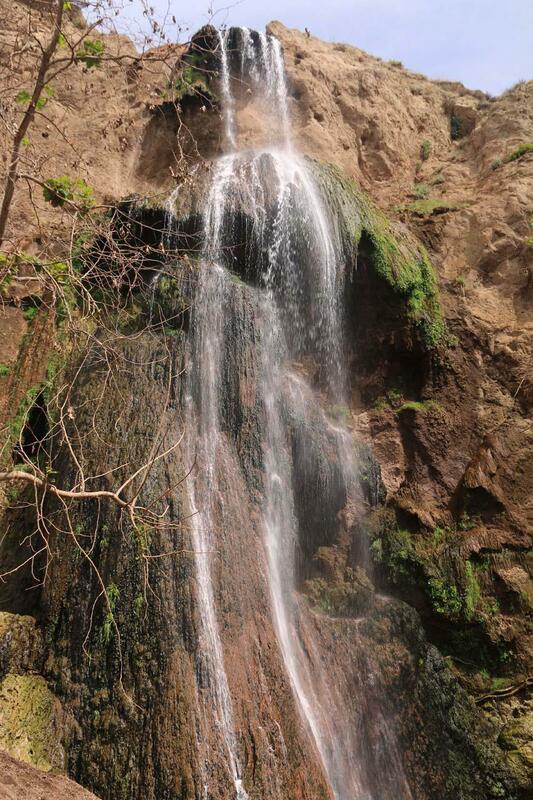 It then hugged a narrow ledge towards another stream crossing with a small middle-tier cascade fronting it. 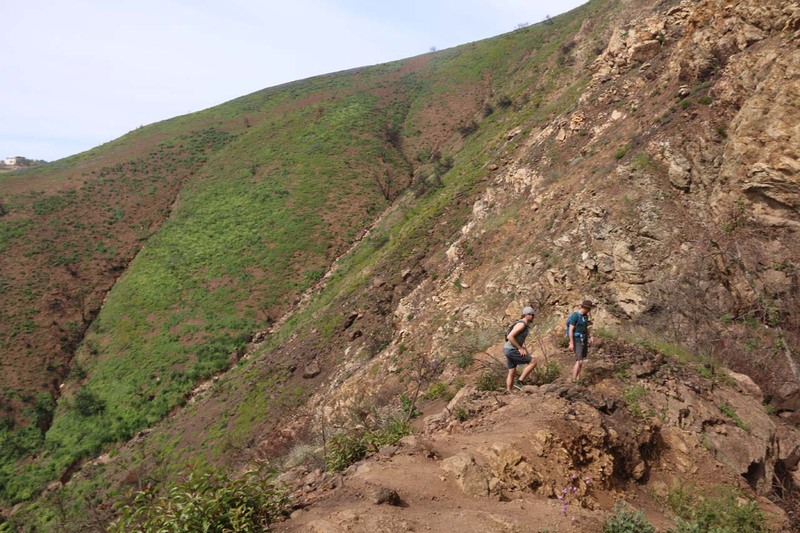 After the middle cascade, there was another steep climb with a particularly tricky section up some more rocks with particularly large spaces between “footholds”. 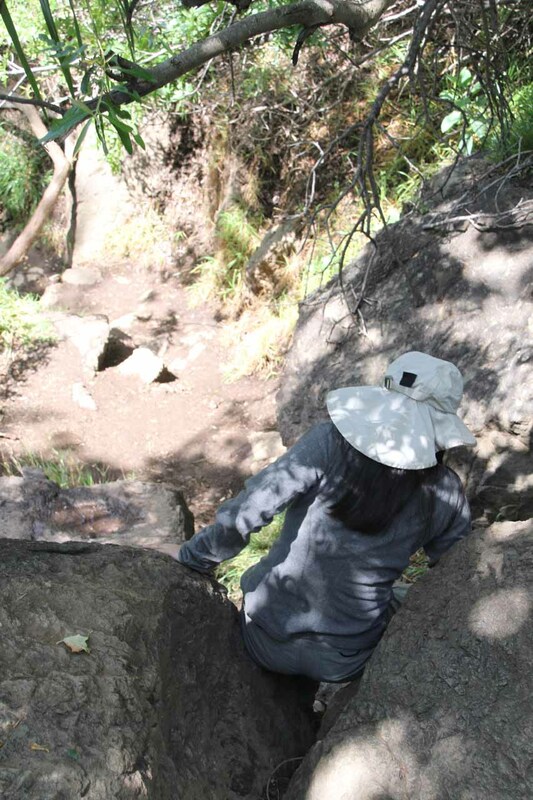 We definitely had to exercise caution here given how easy it was to slide back down and take a potentially nasty fall. Once we traversed this nearly vertical rock-wall obstacle, Julie and I were able to follow the path along the stream until we arrived at the base of the upper waterfall. 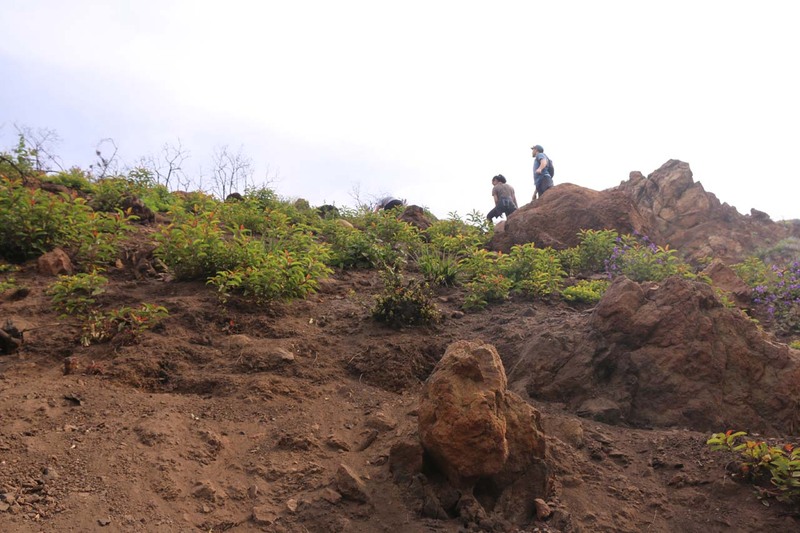 Given the adventure it took to get here, we definitely lingered for as long as possible before facing the same obstacles on the way back down. In this instance, going down seemed just as challenging (if not more) than going up due to the dropoff exposure and slick footing. 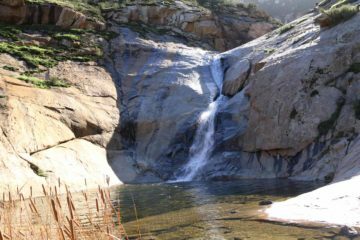 In any case, with the Upper Escondido Falls included in the overall excursion, the round trip hiking distance was more on the order of 4.2 miles. After the Woolsey Fire took place in late 2018, when I re-visited this upper waterfall in 2019, I didn’t recognize the “path” described above. 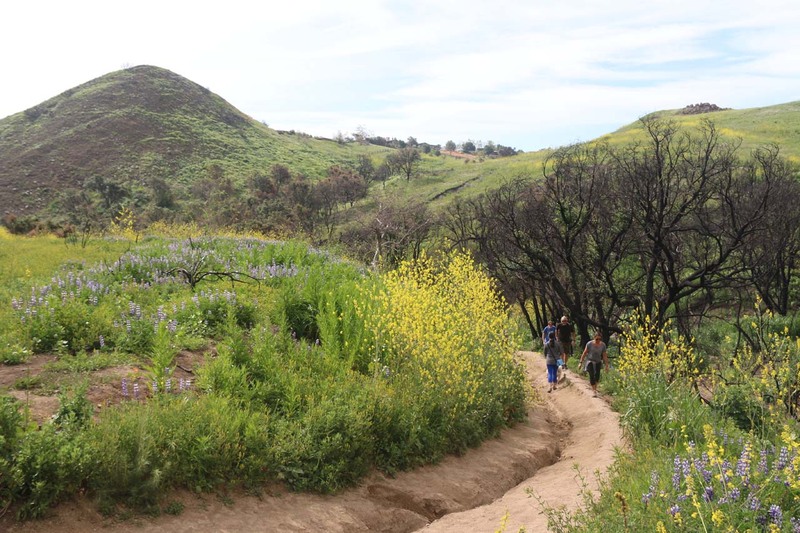 In fact, the fire managed to burn off most of the vegetation. 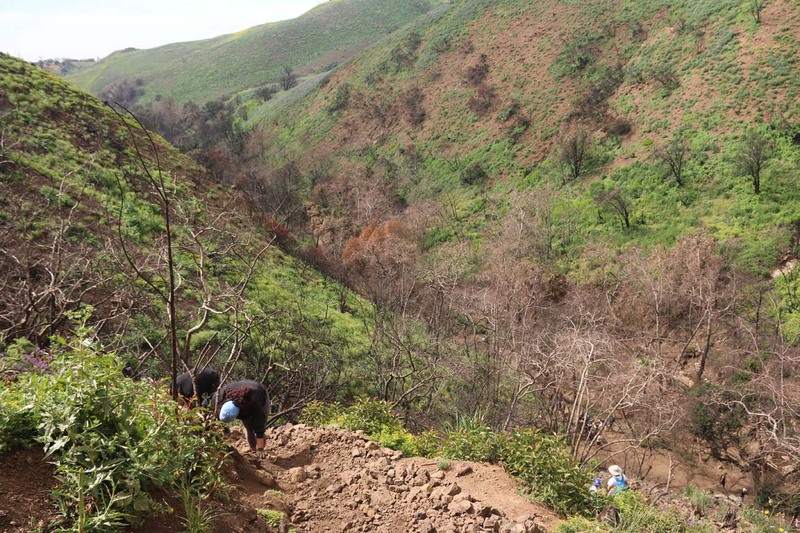 This meant that the very greenery that actually stabilized the soil of this steep hillside was no longer there! 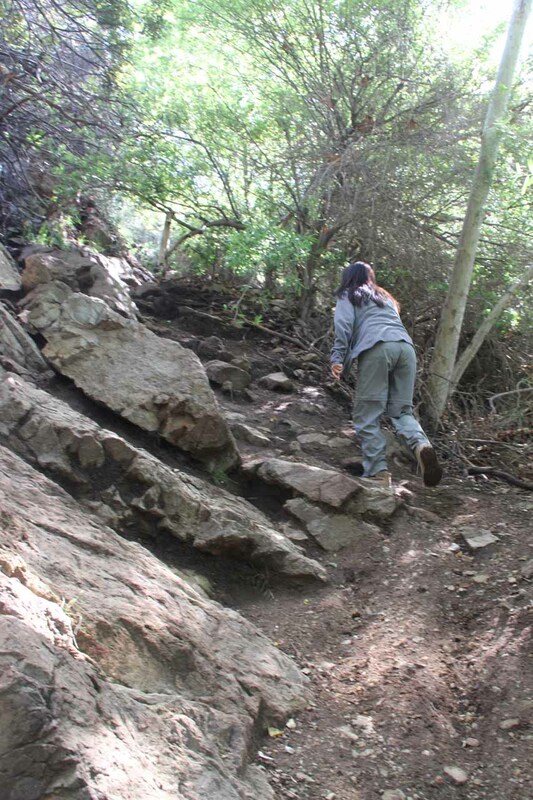 As a result, the scrambling became even more treacherous, especially if wearing improper footwear. 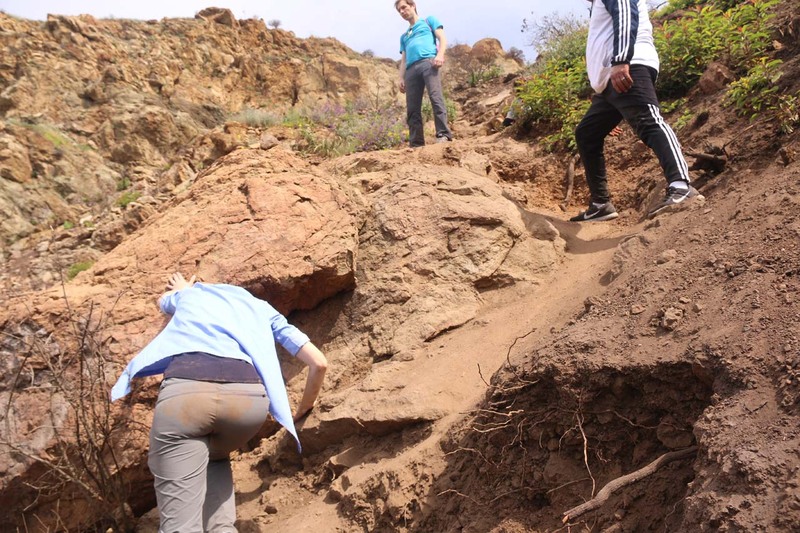 I saw numerous people doing this unprepared while irresponsibly kicking down rocks towards unsuspecting hikers down below in the process. 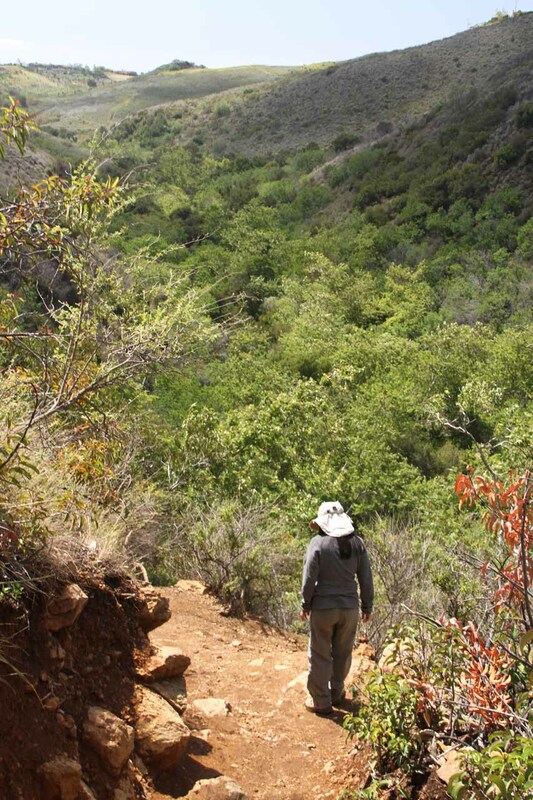 Not only was the ascent even more trickier (i.e. 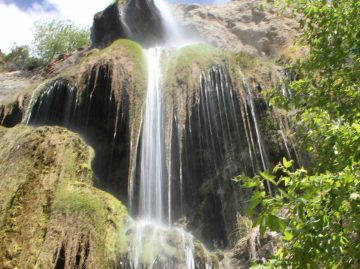 more slippery and more eroded) than it had been in the past, but the descent also seemed even more dangerous than before. 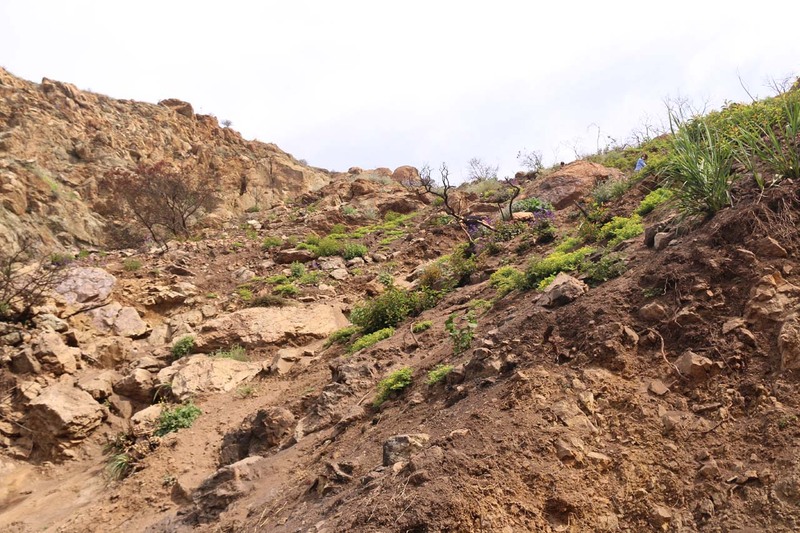 Looking back on that experience, I personally wouldn’t recommend doing this scramble until the hillside has had a chance to re-vegetate and re-stabilize the soil. But given the amount of people (prepared or not) doing this scramble and causing even more erosion, it might take a long time (if ever) before such soil stabilization could occur. While you’re always going to have conflicting or bad advise from the Socials by people who have also done this scramble, don’t say I didn’t warn you! Escondido Falls resides in the Santa Monica Mountains Conservancy. For information or inquiries about the area as well as current conditions, visit their website. 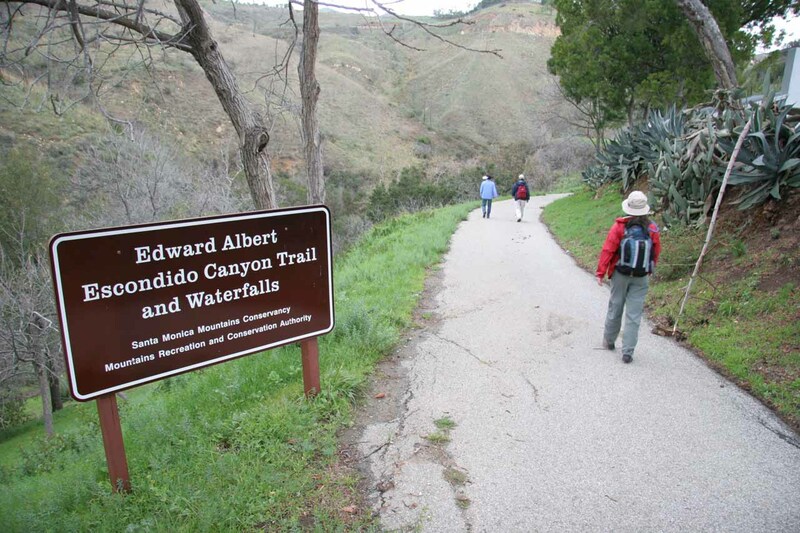 There are many ways to drive to the Escondido Falls Trailhead. 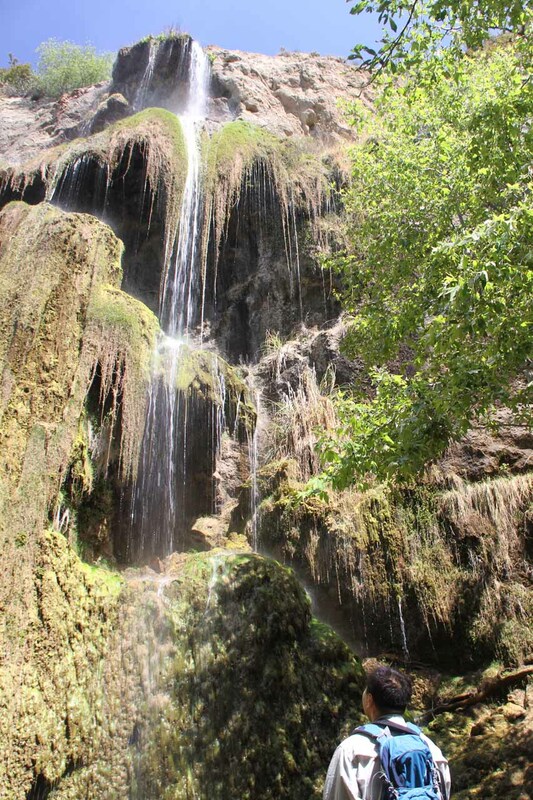 However, we’ll focus on the I-405 and I-10 junction as the starting point of these driving directions since we’ve always crossed this junction every time we’ve visited this waterfall. So from the I-10/I-405 junction, we headed west on the I-10 freeway through the city of Santa Monica. We followed this freeway for a little over 3 miles to its end, where the road bent north near the Santa Monica Pier vicinity and became Pacific Coast Highway or PCH. 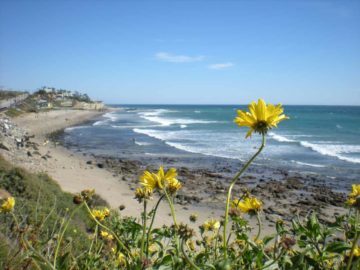 We then continued on the scenic PCH, which hugged the coastline for most of its drive, and we followed it for the next 18 miles. 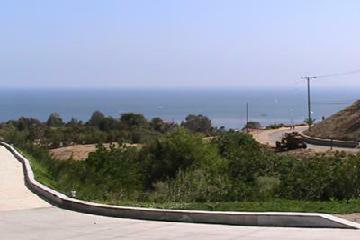 Roughly 4 miles west of Pepperdine University in Malibu, PCH then intersected with the Winding Way Road. 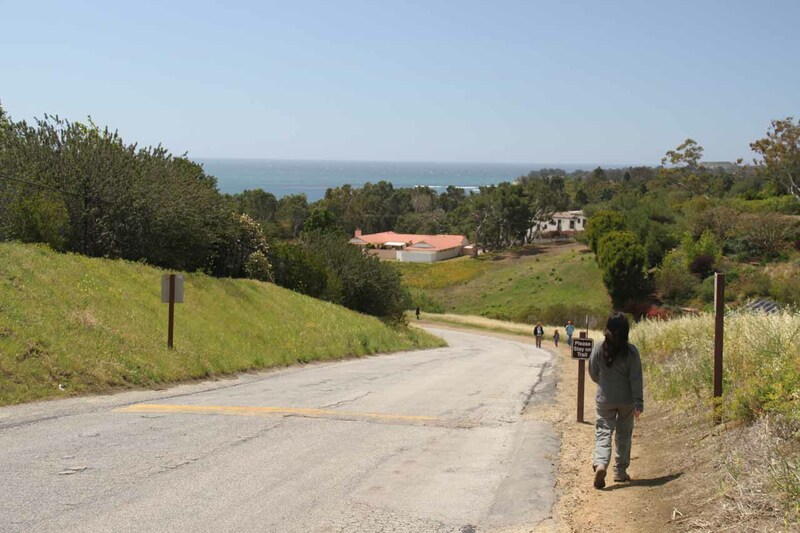 Given the high speeds on PCH, this road was easy to miss. So if you happen to reach Kanan Dume Road, then you went too far. 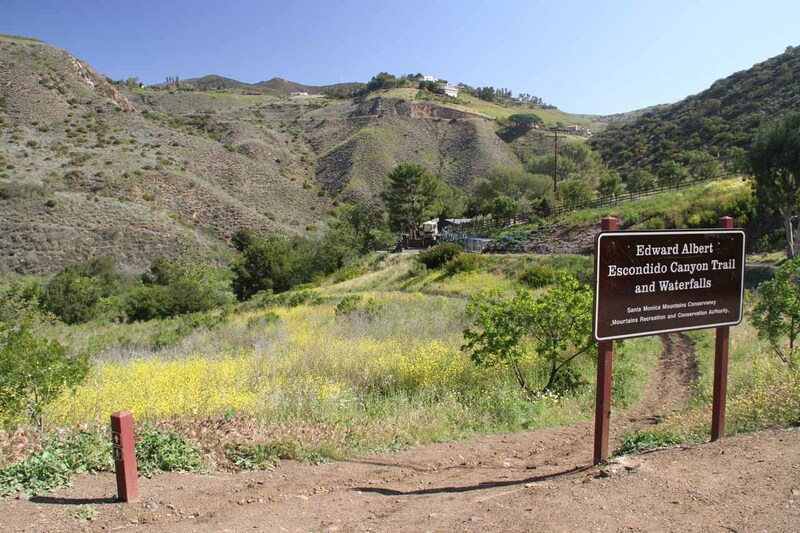 Nonetheless, the important thing about this road was that the official trailhead parking for Escondido Falls was on the northwest corner of this intersection. It looked like recently, they started charging for parking in this lot. It was $8 as of April 2019. 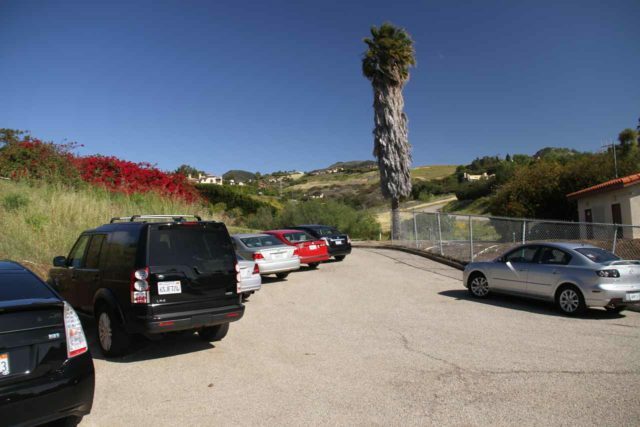 If the small lot is full, we could find street parking along PCH as long as we didn’t park in the no parking areas around the call box. 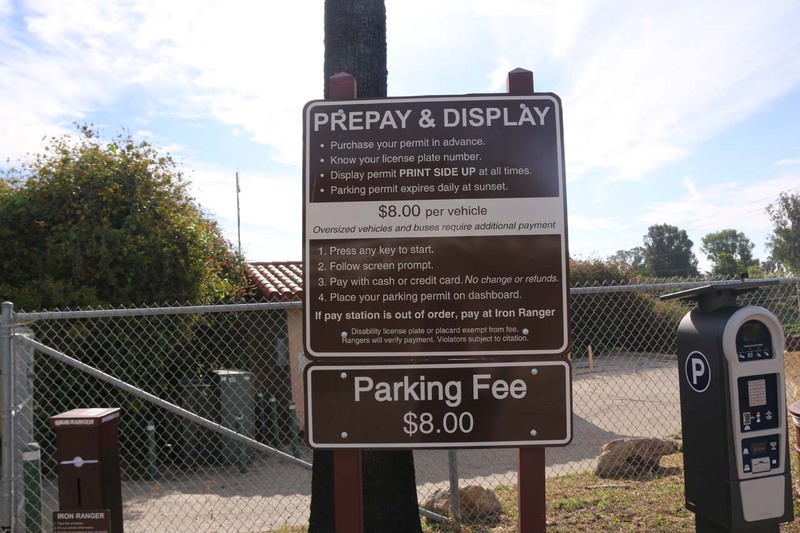 Street parking was free as of April 2019. Speaking of no parking zones, only residents are supposed to drive beyond the parking lot area on Winding Way Road. 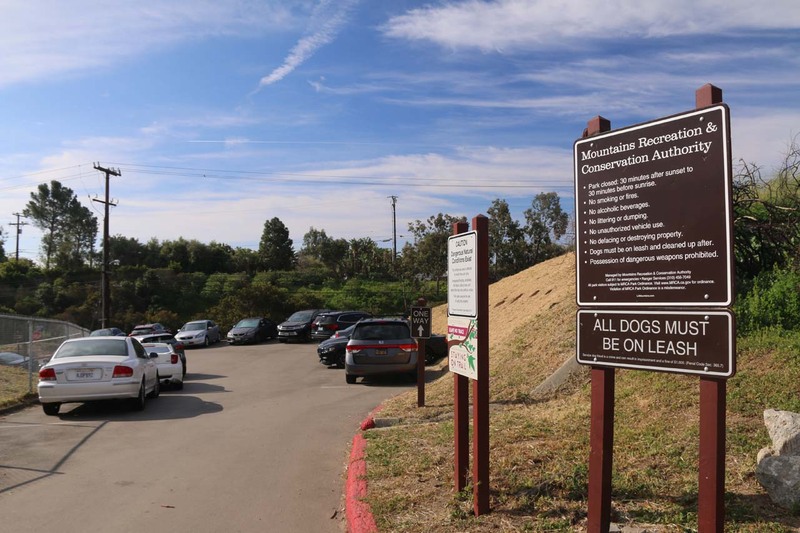 There are plenty of signs and wary residents keeping a watchful eye on violators who choose to leave their cars where they’re not supposed to be on Winding Way Road. 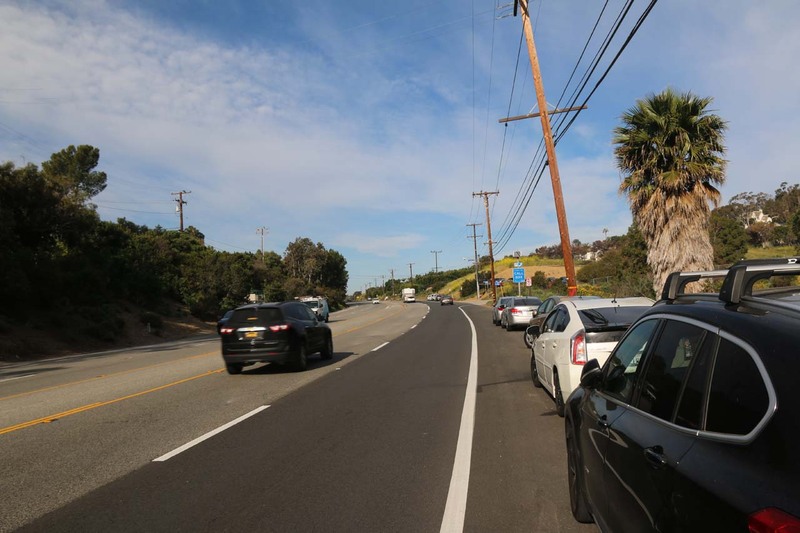 If you find that you have to park on the eastbound side of PCH, be very careful about crossing PCH on foot because people do road rage and overspeed on this road. 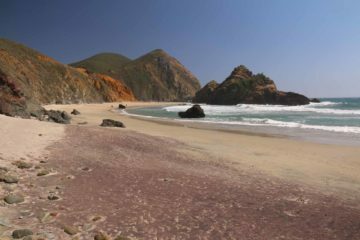 Anyways, the drive described on this route took us around 30 minutes (not counting the drive times required to even reach the I-405/I-10 junction in the first place). 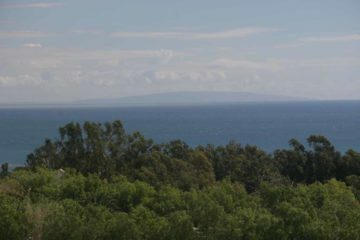 For more geographical context, Santa Monica Pier was about 16 miles (30-60 minutes depending on traffic) west of downtown Los Angeles, 52 miles (90-120 minutes drive) northwest of Irvine, and 47 miles (over an hour) east of Oxnard.